The mainstream media’s narrative really seems to be that tenure, and not the takeover by administrators (and social justice warriors), is a big part of the collapse of higher education. Hey, I realize that “job for life” does sound like it has immense potential for abuse but compared to the abuse administrators already deliver to higher education, every single day, it’s hard to be concerned about tenure. Not content to simply wait for the faculty with tenure to simply die off, states are now terminating the tenure laws, replacing them with, literally a strongman to take over. A bill in Missouri would end tenure for all new faculty hires starting in 2018 and require more student access to information about the job market for majors. 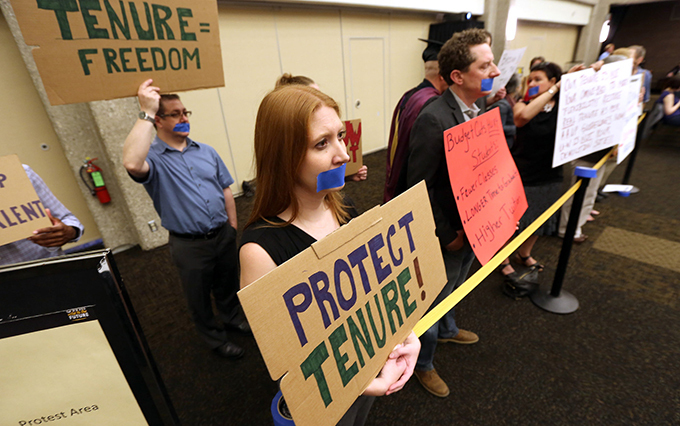 Legislation in Iowa would end tenure even for those who already have it. The usual arguments against tenure are trotted out, with little in the way of counter-argument. Ok, a few counter-arguments are expressed in the comments, but I want to mention some things that just never seem to get said. This is little different than a usual government request for your private information: if you’ve done nothing wrong, you’ve nothing to hide, right? The problem of course is that private information might someday be used against you by someone unethical, with access to government information. Similarly, tenure isn’t necessary when your boss is honest…but that’s a rarity in higher education today. I’ve seen so many honest faculty members, possessing integrity and ethics, blasted off campus for trying to do their job with honor. Sure, yes, doing an honest job with honest bosses would negate the need for tenure but…honest bosses? My blog has around two hundred posts now describing administrative corruption in myriads of ways. From fiefdoms with multiple (independent) embezzling schemes occurring in them, from cover-ups of generational academic fraud programs to simple plundering (to give a tiny sample of what goes on)…and this representative says we should just trust admin not to do it anymore? Doing the right thing and doing your best work means nothing when you’re working for a guy who makes his money by abusing the vulnerable, whether it be students or faculty. A tiny bit of job protection is too much to ask. Really? “What other job in the U.S. has protections like that?” Brattin said of tenure. –this guy serves one term and gets full salary retirement benefits for life. A bit of hypocrisy here, I think. Hey, give me full salary with benefits for life after teaching one year, and I’ll stop defending tenure. On the surface, this is a good point but…scholars aren’t the same thing as truck drivers (the most common job in the US), waiters, or burger-flippers. I again point out that tenure is typically rewarded after a decade or so of scholarship…but there’s more to it than that. That fast food restaurant on the corner? It probably won’t be there in 30 years, and those big trucks don’t stay in service for 30 years or more, either. Universities, however, are far, far, more enduring, and universities lasting centuries, even a thousand years, are far more common than most every business around. Universities, even more so than governments, have a sense of permanency to them…thus it’s not so unreasonable to give scholars some level of permanency as well. Universities have (more accurately, “had”) a strong record of integrity to them, and, at least in the past, took their responsibilities to preserve, generate, and spread knowledge very seriously. They honestly helped humanity, and did good work. It’s quite common for people to give huge gifts to universities…say, how often has someone died and left a few million bucks to a local McDonalds? On the other hand, such gifts to universities are common, and, in the past, the gifts were used to further the university mission. Now, you can literally give $4,000,000 to a university, and administrators will spend $100,000 on the mission, and fritter the rest away into their checking accounts. Tenured faculty, bound to the institution, would invest those gifts wisely, because tenured faculty were scholars dedicated to the institution, interested in doing more than merely helping themselves. Our institutions are controlled now by an administrative caste that wanders from institution to institution, plundering as much as they can before moving on. The only thing that’s kept even a small amount of integrity in higher education is the remnant of dying tenured faculty, keeping a death grip on integrity and standards…it’s cutting into the plundering. So, yes, tenure isn’t in most other jobs…but other jobs don’t last a thousand years, and don’t do work good enough to generate gifts, which over time can add up to billions. Joe Gorton, an associate professor of criminology at the University of Northern Iowa, said he thought arguments in favor of either bill betrayed a serious ignorance about how academe works. I’ve seen faculty fired for asking admin to steal even a little bit less, but let’s pretend that’s not, ultimately, what this is about. Tenure is even more important today than it has been in the past. Our campuses have turned into echo chambers, reciting fake news as it’s been fed to us by established fake news sources. Because tenure is dying, there’s a culture of terror on campus that tells faculty repeatedly “don’t dare speak out against the echo.” There are literally entire series of articles by academics so terrified to speak out against what’s going on in higher education that they must speak anonymously. I suspect that if we brought tenure back to where it used to be common, instead of driving it to extinction, our campuses would return to being places of open discourse and true investigation of actual knowledge…instead of scholars skulking in the shadows secretively doing what little they can.